As the Syrian Army continues its march on Quneitra, the last rebel-held enclave in southern Syria, government victory in the area is inevitable. Many of the dozens of towns and villages captured during the Syrian Army’s latest offensive simply gave up, agreeing to “reconcile” with the government rather than continue fighting. Even Daraa city, the “birthplace of the revolution”, quit resisting and surrendered to the government, changing hands over the course of two days. Such an event would be inconceivable two years ago, when the rebels were still vigorously resisting the government. The two major factors which led to this dramatic shift in the war were the massive Russian airstrike campaign against the rebels starting in 2015 and the withdrawal of US military aid to the rebels in 2017. Without these factors, the war may not have ever swung to the government’s favor. 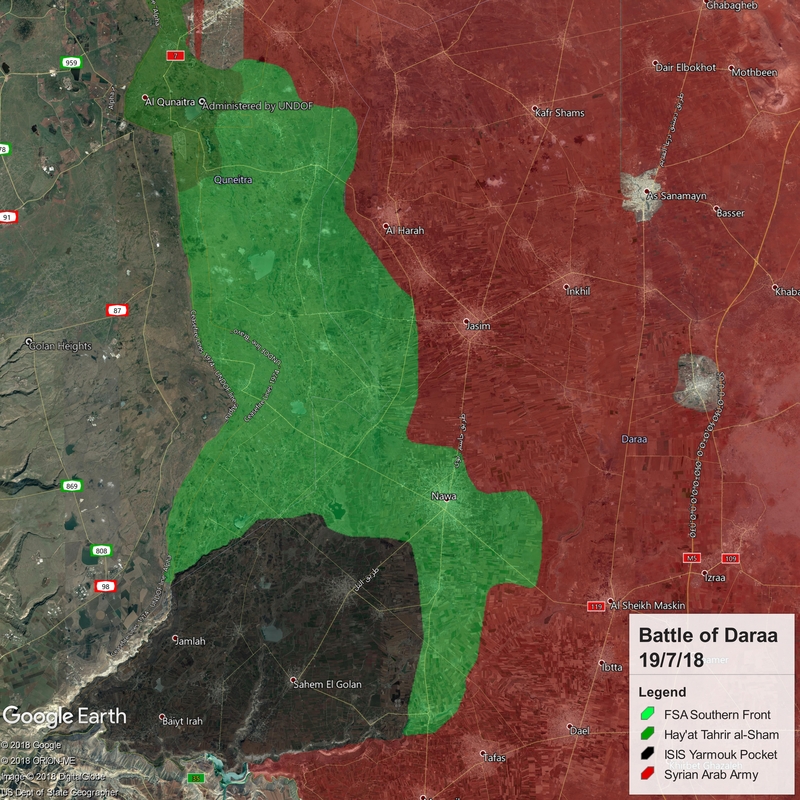 The Free Syrian Army’s Southern Front, its largest and most successful branch, was the primary group defeated in the Daraa offensive. Those final remnants who have not yet surrendered to the government are being increasingly squeezed in Quneitra, and will doubtless lose the battle within the next few months. What other rebel groups remain in Syria? The largest Islamist group is Hay’at Tahrir al-Sham, the former al-Qaeda affiliate. This organization, although not a direct proxy of Turkey, has been forced to bow to Turkey’s will, as it was forced to let Turkey build multiple military posts in its territory. The next largest Islamist groups are Ahrar al-Sham, Nour al-Din al-Zinki, and the Levant Front, which are all direct Turkish proxies. The only other major opposition group in Syria are the Syrian Democratic Forces, which are a proxy of the US/UK/France. Even this group is currently negotiating with the Syrian government to possibly surrender and return to its rule (with some provisions, such as regional autonomy). The new paradigm in Syria has been made ever clearer by recent Syrian Army victories on the battlefield: armed resistance is no longer a viable option for survival. The only choice left for opposition groups is to negotiate or surrender.